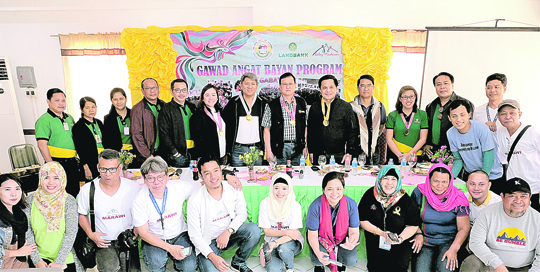 LandBank has launched its Gawad Angat Bayan, a social responsibility program that aims to support the psycho-social needs of internally displaced persons affected by the siege of Marawi City, especially its children. Leading the launch of GABAY Program are (standing behind table) LandBank executive vice president Liduvino Geron and first vice president Catherine Rowena Villanueva, first vice president Khurshid Kalabud, HUDCC Secretary and Task Force Bangon Marawi Chairman Eduardo del Rosario, Marawi City Mayor Majul Usman Gandamra, and Balay Mindanaw Foundation Inc. president Charlito Z. Manlupig. They are joined by other representatives from the LandBank and The Balay Mindanaw Foundation Inc. The launch was held on Jan. 17 in Marawi, led by LandBank executive vice president Liduvino Geron and officials from partner organizations led by Housing Secretary and Task Force Bangon Marawi Chairman Eduardo del Rosario, City Mayor Majul Usman Gandamra, and Balay Mindanaw Foundation Inc. president Charlito Manlupig. Also present during the launch were officials and representatives from the LandBank Corporate Affairs Department, Marawi Branch, and Cagayan de Oro Lending Center. Part of the launch was a visit to Barangay Bito Buadi Itowa Transitional Shelter, where psycho-social support activities were piloted for the children. Dubbed as “Bahay Pag-asa,” the transitional shelter houses child-beneficiaries as young as 6 years old. As part of the PSS activities for children, books that promote children’s rights were also distributed onsite. Funded by the Department of Finance under the Kreditanstalt für Wiederaufbau-Interest Differential Fund, the GABAY Program is implemented in partnership with Balay Mindanaw. BMFI is an internationally recognized non-government organization from Cagayan de Oro City that specializes in disaster response and preparedness initiatives. The program aims to provide PSS for affected individuals, and to develop community leaders especially among the youth and women. At least 2,000 IDPs from the identified evacuation sites and 11 other barangays are expected to benefit from this program. The main components of the program include a trainers’ training for community leaders, conduct of PSS activities, eco-therapy through organic farming, post-activities support communication, and other interventions needed by the participants, including possible livelihood opportunities. The GABAY Program is implemented in close coordination with the TFBM, and the Islamic City of Marawi LGU officials. “Having programs like GABAY complement the government’s massive rehabilitation efforts for Marawi is very important. This will help us make sure we are addressing all the needs of the affected individuals,” Del Rosario said. Many thanks to everyone who is part of this program, including LANDBANK and Balay Mindanaw,” added the HUDCC Secretary. Mayor Gandamra also expressed appreciation and gratitude for the program, on behalf of the people of Marawi. “This program is just the beginning, as it would take true commitment and cooperation from various sectors to help our brothers and sisters in Marawi rebuild with renewed hope, and come out of this stronger and better,” said LANDBANK’s Geron.